For any woodworker or a DIY enthusiast, a solid workbench is an important equipment. It helps to finish the woodworking projects easily. And if you are going to assemble your own table, then choosing the right workbench top is the most essential thing. Today, we will have a look at the best workbench surface options available in the market. Why be choosy for a workbench surface? A good-quality workbench top can help you to save a lot of efforts and money. If the surface does not have a quality material and construction, then you may end with a broken top or may have to face issues while doing woodworking on it. A good-quality workbench top will not only help you to finish the wood tasks, but also can be used in the garage, laundry, office, kitchen, and many other places. So, picking up the right product is necessary for your carpentry and other woodworking tasks. I hope you are now convinced to get a good-quality workbench top for doing your job easily and satisfyingly (you can contact me if you still have doubts). So, let’s go to the list now. You may know that the Grizzly is a well-known manufacturer of the various types of woodworking tools like jointers, planers, belt sanders, etc. The company provides many durable products for hardwood jobs. 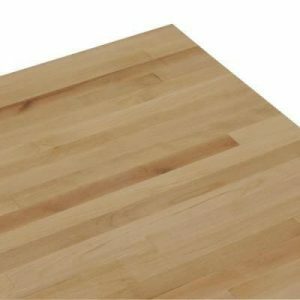 This solid maple workbench surface from Grizzly is another top-quality product that you can use for your heavy-duty projects as well as for kitchen countertops. This unit has a pure, tested sugar maple material which makes it solid and durable. Every inch of this product is laminated and coated to make it maintenance free and provide you an ease of working on it. It is 1.8” thick and has a size of 36” by 24” which is enough for your most jobs. The optional shop fox legs are adjustable which help you to customize the size of the workbench as per your requirements. The bottom, top, and all the other edges are sealed with a clear satin smooth finish. The Quick Bench provides one of the best-rated workbench surfaces for the money. It has a heavy-load capacity which makes it ideal for extra heavy-duty jobs. If you have a small space in your workshop, then this is an ideal option for you. It has an approx dimension of 48” by 20” which makes it a large workbench top in the price. 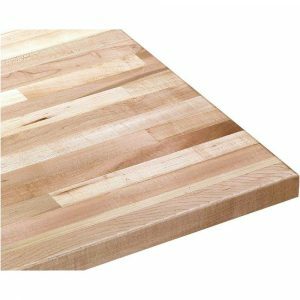 This solid hardwood butcher block top has a thickness of 1.2” which is good enough to handle most jobs. You can choose from two options; either opt for a UV treatment or get an unfinished rough top. The choice is yours. It has a weight of 34.5 pounds but due to the heavy-duty brackets, it can handle up to 500 pounds on it if you place it properly. This workbench top has a foldable design with an easy fingertip release mechanism which will save your workspace while not in use. This maple bench top from Nexel is a quality product which got enough consideration from the pro woodworkers all around the world. You can use it as a woodworking top in your workshop or as a countertop in your kitchen; your wish. It has dimensions of 72 inches by 30 inches that makes it biggest in its category. The 1¾” thickness stands for continuous and heavy-duty uses. This maple bench top stays dry and hard on the top due to the kiln dry and is sanded, cured, and glued for a smooth & durable finish. Its penetrating mineral oil protectant makes it sturdy and well-structured. It has a weight of 78 lbs. You can have optional attachments like flared fixed legs, casters, and dual-sided power outlet for the customization of your workbench. This model is an upgraded version of the previous G9913 solid maple top from Grizzly. It has a hybrid material of maple and durakryl with a satin smooth finish and natural color. Its charming look and long-lasting operation make it an ideal choice for the professional woodworkers and DIYers. It has a 1¾” thickness with 60 inches by 30 inches of dimensions to handle your all wood projects. You can customize the workbench as per your wish with the help of the optional shop fox legs. Even though it has a weight of 102 lbs., it is convenient to carry design makes the transportation task easy for you. 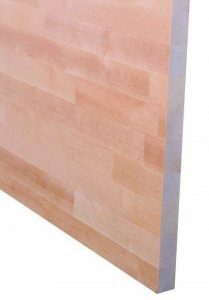 Its high-quality and smooth surface helps you to use it as a woodwork surface or a kitchen countertop whatever you like. The durakryl finish coating allows you to clean and maintain it easily. If you are an environment lover and want an Eco-friendly yet sturdy workbench top, then go for this worktop surface by Ulti-MATE Garage. It comes in a natural wood color with a smooth surface and works great with the environment. It has a 1.5” thickness and dimensions of 71” by 21” to handle the heavy-duty woodworking projects. Its 70 lbs weight makes it strong enough to handle heavy loads as well as increases its working life. The UV cured design makes it moisture resistant. At the bottom of the wood, there are non-skid strips to keep it firmly on any surface. The high-quality PVC textured black laminate makes it scratch resistant. It is ideal for workshop, garage, kitchen, laundry, office, and other home purposes. The Edsal BB3060 is a top quality workbench top. It is a perfect tool for handling the woodworking as well as electrical wiring and fabric cutting jobs. You can choose your preferred unit from the available multiple options. It has a thickness of 1-3/4” and dimensions of 60” by 30” to handle different types of projects. The high-quality kiln-dried maple strips with a solid lamination on the top makes it extremely durable. It delivers maximum shock absorption when you use sensitive instruments. This workbench top is easy to assemble and lightweight to carry at your place. Even though it is sturdy and durable, the machined parts and dies are harmless to the user. It is ideal for woodworking jobs and kitchen counters. The laminated maple workbench top from Bally Block is a versatile unit with the highest quality of the material. Its UV treaded design makes it sturdy against pressure and abuse. If you have to deal with the heavy duty jobs and materials, then you can go with this workbench surface. If you are a professional worker or an interior designer or a DIYer, then get this bench top which comes with a style and utility. It has dimensions of 60 inches by 24 inches and a thickness of 1-3/4-inch. This workbench top is water, alcohol, and solvent resistant. It weighs around 70 pounds making it stationary to handle heavy-duty jobs. You can use the vises and bore dog holes to set up an ideal workbench for your woodworking shop. Apart from the woodworking projects, it works perfectly well with kitchen surfaces, coffee tables, bars, etc. 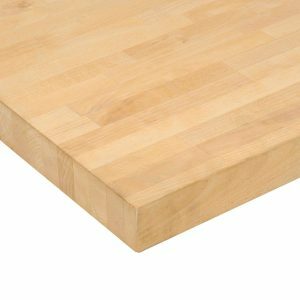 What to look for in a workbench top? When you are spending your money for making a customized workbench for your professional or personal use, then you should check all the things that required for a top-quality product. The perfect workbench surface should have a clean surface without any scratches or marks. Depending on your work type (occasional use or daily use), you should opt for a suitable size of the top. A good workbench top comes with a large surface area to handle different types of jobs. It also has a soft yet durable material for making it more friendly to the things you are working on it. If the surface is laminated and pretreated, then it will last for long and will properly fix to the table. 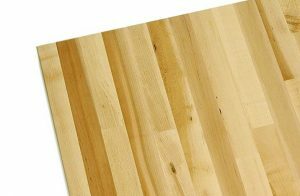 All these features are common in hardwood boards, so if the workbench top has hardwood material in it, then your task will be easier to choose the right option. The other types like softwood, butcher block, plastic, steel, hybrid, etc. also work well in particular conditions. So, check the material of the workbench top also. When you buy the best workbench top, then your woodworking will become easy. No matter how many loads you put on the workbench, you will be a happy person after the job done. Such workbench surface is also easy to clean and maintain which will save your lot of time, efforts, and money. It can be used for multitasking like wooden work, kitchen, laundry, electrical wiring, fabric cutting, etc. which makes you free from purchasing separate tool for your different needs. Some workbench tops even come in Eco-friendly designs, so they will help to protect the environment too. 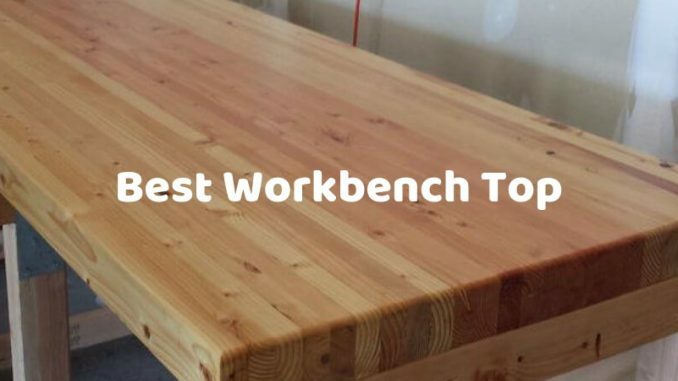 I have listed all the top-rated and varieties of workbench tops which will help you to pick up the right option according to your requirements and budget. Let me know which workbench surface will you buy? And why? You can visit the comment section below to provide your inputs. Thanks for staying till this end.